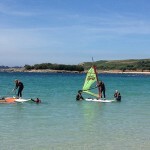 We cater for all ages and abilities, very young to very young at heart, Scilly offers perfect conditions for sailing tuition what ever your level. Taster & refresher sessions to full courses. All instruction at The Sailing Centre can be tailored to suit your individual needs for any level of experience. We offer 1 & 2 hour sessions to full courses, private 1:1 sessions to help you progress quickly or group sessions where you will learn with like minded people of similar abilities for a fun and sociable experience. We can offer certificated courses through the esteemed RYA sailing syllabus. 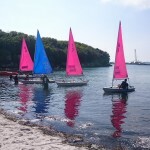 You do not need to take part in an RYA course to enjoy a day out on the water with our sailing instructors. Our accompanied day boat sail, private instruction or a two-day courses are all fantastic ways to have some fun on your holiday and dip your toes into the world of sailing! If you do not see a course or programme suitable, please contact us to discuss your requirements. 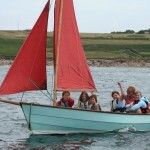 A one or two hour session is perfect as a trial or taster to introduce you to sailing. A little rusty and just wish to get your confidence back or build on previous experience. Great for little ones or to see how you get on before committing to a full course. Perfect for a taster session as a family. 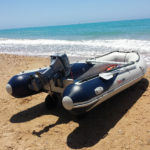 “Relax as hard as you like” Let one of our experienced helms take you out in one of our stable day boats for a cruise. Get stuck in and have a go yourself or sit back and let the instructor do all the work. Sessions are by the hour, half-day or full-day a great way to experience sailing and enjoy the waters at a leisurely pace. Our two-day course consists of two sessions each day tailored to the specific needs of the individual or group to progress and improve sailing ability. The nature of each session will depend on the student’s ability with maximum time afloat, shore based theory and observed practice time. If you are doing an RYA course you may progress through more than one level during this two-day course. This aims to introduce you to the sport of sailing. 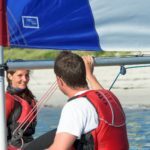 This 2-day course (as above) covers all the basics to get afloat and have as much fun as possible and hopefully inspire you to take up sailing regularly. Build upon your previous experience and progress your sailing technique and knowledge. You will develop a wider breadth of knowledge and understanding of sailing and safety awareness. We are able to run each of these more advanced courses to progress your ability further, and help you become a more advanced and competent sailor. Basic rigging. Launch & recovery. 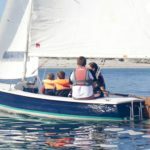 Sailing techniques, basic steering and control. Capsize recovery. Basic boat parts and theory. Learning about hazards. The youth scheme is designed for 8-15year olds and runs in conjunction with the RYA national sailing scheme, but has been broken down into smaller more manageable sections for junior sailors.